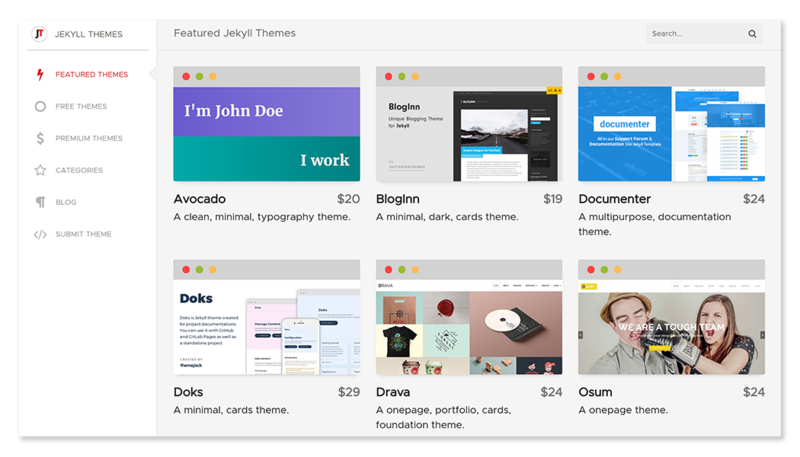 The idea of jekyll-themes.com was to update the latest Jekyll themes in the collection as soon as possible. We have been following that over the years. had a bounce rate of around 60% which is average. We hope that the new layout can tackle that. So what’s new in this layout?! Most of the theme collection remain the same as the previous website but the presentation will be better. The website will be divided into a constant sidebar and dynamic main section. The homepage will showcase some of the featured themes. Individual theme page displays all the necessary details of a theme including the number of forks, stars, date of creation etc. The page also renders the readme section of the repository. Users can read the installation directions right in our website without having to navigate to the particular repository. The themes are divided into different categories. Find themes listed according to their categories here. You can now search from any page. We have implemented instant search so that the results show up right when you start typing. We hope you like the layout. Let us know.